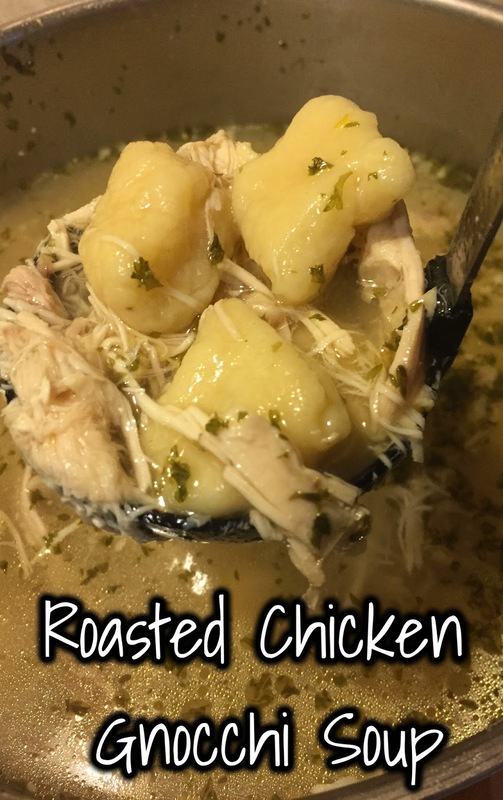 One dish that everyone thinks of being a Southern classic Chicken and Dumplings but with a Italian twist with tiny potato dumplings, Gnocchi. I've made a post of these Southern classic but with a Cajun twist, Cajun Chicken and Dumplings. I'm an avid watcher of Food Network or The Cooking Channel (I'm watching it right now as I write this) and I heard of Gnocchi on varies cooking shows where they tossed with some sauce or they actually made it. I said to myself that I wouldn't like it because I don't like mash potatoes (long story). Growing up when we would go visit my aunt we would go to Olive Garden because we didn't have one close to us then a couple of years ago we finally got one. I tried there famous Chicken Gnocchi Soup and I fell in love with the tiny dumpling called Gnocchi. This is perfect for the Autumn/Winter season with the cooler weather coming and cold and flu season. 1.Wash, peel and boil potatoes in lightly salty water for 20 to 25 minutes, or until you can stick a fork in a potato with ease. 2. Drain potatoes and transfer to a medium size bowl. Mash potatoes. Sprinkle a little salt and pepper. 3. Add in the eggs one at a time, mixing in before adding the next. 4. Sprinkle in one cup of flour. Kneed with you hand in the bowl then add in one more cup. If it is still sticky add in a 1/4 cup of flour. 5. Form it into a ball. Cover with a clean towel and let rest for 30 minutes. 6. Cut dough ball into four sections. Roll it into a log then cut that in half for easy handling. 7. Dust a little flour on a clean surface. Gently roll dough out to 6 to 8 inch rope. Cut into 1 inch dumplings with a knife. Dust a little more flour so the dumplings won't stick to each other. Note: When I rolled out each roll of dough I cut out about 10 each, so this can make about 70 gnocchi. For the soup, you do not have to use them all. You can cut them then let them dry or freeze them and consume later. 1. In a large stockpot, bring together chicken broth, shredded cooked chicken and roasted chicken base to a boil. 2. Add dried parsley and black pepper. 3. Drop in gnocchi one at a time making sure they are spaced out so they won't stick together. Stir it every 10 dumplings. 4. Bring it back to a boil for 5 minutes. 5. Do not let it boil for much long over the gnocchi will over cook and may fall apart. That's not good eats. 6. Let it cool for 5 minutes before consuming. This looks soo good . I love your recipes . I have never tried gnocchi before . Will give it a try . I have never tried making my own Gnocchi but I like the idea of making it into a soup! This looks so good! This looks like a fabulous soup to settle down at the table with on a rainy day! Will be giving it a try. I really love soup, I will try this for my kids! thanks! Wow! This looks awesome. And you're right, this sounds perfect for a cold fall day. I can't wait to try it. This looks so filling and satisfying. It will be awesome to make in the fall to warm me up! Great recipe! I just love this idea! my kids love soup - am sure this will be a hit. This looks so delicious! This would be perfect for the upcoming seasons, especially the cooler fall days! 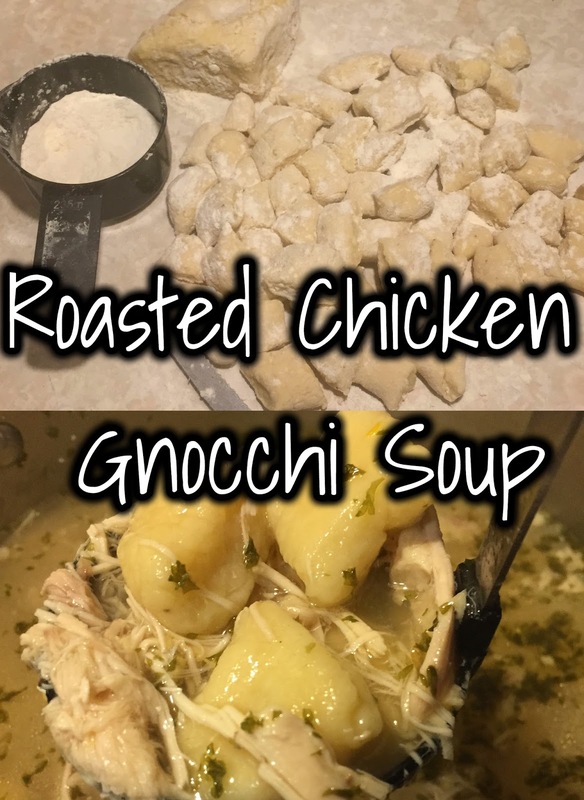 I love gnocchi - never thought of adding to chicken soup, it sounds lovely. I look forward to trying it! I have never tried gnocchi before. I have always heard about it and seen it but never attempted to try it lol. This looks very good and now I am thinking about heading to olive garden to try some! This looks so delicious! I tried making pumping gnocchi before and I miserably failed. I'm definitely going to try your recipe, maybe I will have more luck by using the potatoes! this roasted chicken gnoochi soup looks good! I can't wait to try tihs. I'll have to try this out! These noodles look so soft, need to try this. I have never tried making my own Gnocchi but we recently tried making our own sushi with success so I am feeling confident. I have never met a gnocchi I didn't LOVE! I haven't made them myself before but this is inspiring me to try! Looks so yummy! Love soup, but never thought of trying this with Gnocchi will defiantly give this a try one day. You've made me very hungry! The soup looks good. I would like to try this sometime. Thanks for sharing. Thanks for sharing this recipe. Though I am a vegetarian but I would like to try this with an vegetarian alternative in upcoming cold season. Perfect for cold fall nights, also an Olive Garden favorite when we go!! Thanks for sharing! This recipe is perfect for chilly fall nights, also one of my favorites when we go to Olive Garden! That sounds so yummy! I love gnocchi, but haven't tried it in a soup before. Perfect for the cooler weather that's approaching. This looks so delicious and filling. I bet my boyfriend would love this. Thanks for sharing. Sounds delicious! I will definitely try this one out. I love soup during rainy season. Thanks for sharing your great recipe. I love Gnooci! The soup is a great idea. Great for a comfort food! I have not made this soup at home but I had it restaurant and it is so yummy. Wow! This looks so good! I'll have to try this recipe! That look sooo good and delicious! Thanks for the recipe and we'll try it this weekend! Mmm, this looks so good! I love chicken and dumplings, so I know I'm going to love this! Ooh that looks SO delicious and so comforting! I love gnocchi so much but ive never had it in a soup. This may sound very odd to you, but I don't think it over had dumplings. I'm going to have to try this recipe out! This soup sounds sort of like Italian Wedding Soup which is delicious! I bet this soup tastes just as good and I love gnochhi!